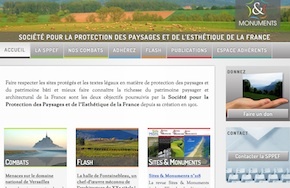 29/11/12 - Internet website and heritage - Anyone who finds reading the bad news often presented in The Art Tribune a depressing experience should perhaps refrain from consulting the new website of the SPPEF, Société pour la Protection des Paysages et de l’Esthétique de la France. Its president, Alexandre Gady, had recently announced the launching of the site in our filmed interview. The posting is now therefore official and we nevertheless recommend our readers to look notably at the Flash column listing several threats to our heritage. In fact, each deserves an in-depth article in our publication and we will perhaps attempt to do so but the task is so daunting that it would be difficult to achieve. For example, we learn that for 20th century heritage, the Halle built in Fontainebleau in 1941 by the engineer Nicolas Esauillan, whose technical and aesthetic qualities are quite obvious, is to be destroyed ; that an entire neighborhood in Bastia (Corsica) dating from the 16th and 17th centuries is also under serious threat, recalling the darkest days of urbanization in the 1970’s ; that the charming Italianate theater in Evreux, a city which was largely destroyed during WWII is close to collapsing due to municipal incompetence... And this is just for the month of November. Fortunately, there are also some good tidings such as the restoration currently underway for a church in ruins as well as that of a chateau. However, readers will quickly realize that vandalism of various forms must be fought every inch of the way by publishing articles and exposing scandals, our purpose exactly here at The Art Tribune but associations for the protection of heritage should also dispose of more extensive means, particularly this one which operates on a national level and has been recognized of public utility, so that it can take legal action when needed to stop projects menacing our country’s cultural interests. Once again then, we encourage our readers to join the SPPEF, knowing that membership fees benefit from generous tax deductions.